In Part 4 of this series, Google Analytics Demystified: Part 4 – Conversion Tracking I explained briefly what conversion tracking was, how it could help you, how to install it, and provided an updated release of a new Simple Google Analytics Zen Cart contribution to which I added Conversion Tracking. Keep in mind that for Goal and Funnel tracking to work properly you must first have the “Vanilla” Google Analytics tracking code in place. If you do not, then you will get “0’s” (zeros) and empty data in your reports. Goal tracking gives you the ability to set up to 4 unique goals that you would like to keep a record of for important events (actions) that users take when they visit your site. These Goals can range from simply filling out a contact form, to downloading a free brochure, to an actual sale that generates revenue. The choice is yours, but choose wisely. At the time of this writing, Google only allows you to track up to 4 total goals. I would choose those that have the biggest impact on the success of your business. Unlike the first three components we have reviewed in this series on Google Analytics, Goal Tracking does not have its “own” set of tracking code you need to install. As indicated above in my note, it operates off of the installation of the “Vanilla” Google Tracking code. However, just the installation of the “Vanilla” tracking code alone will not activate Goal tracking. You must do that from within your Google Analytics account. To start Goal Tracking in Google, you need to set up the goals and optional Sales Funnels (which I will talk about later in this post) from within your Google Analytics Account. The following is an illustration of how you might setup Goal Tracking for your online store. First, when you login to your Google Analytics account, click on the “Edit” link next to website that you wish to setup a Goal for. On the page that follows click the “Edit” link again next to any one of the open conversion Goal slots (you have 4 to choose from). You’ll come to a page that looks like this near the top. In the above screenshot, you see that in order to setup a Goal, you must enter at least two elements (the Goal URL, and the Goal Name) and then activate it by selecting the On radio button next to the “Active Goal” section. If you setup a Goal and do not set it to active by choosing the “On” radio button, then your Goal will not record data even it you save it. Save your changes to setup your Goal. When you combine Goal tracking with Funnels, it opens a world of knowledge about the efficiency of your website’s ability to take visitors down a path that leads to a sale. Funnels, when attached to Goals, point out trouble spots in your “conversion chain”. These trouble spots oftentimes cause visitors to abandon the process and lead to a loss in sales for you. Using Funnels, you must find these weak points and barriers in your site and address them making changes as needed if you are to have a shot at increasing sales. A partial sample of what a Funnel report and associated Funnel path might look like is shown below. The above funnel depicts a partial “conversion chain” for an e-commerce website. This portion of the funnel indicates it has no problems (100% of the visitors who start the checkout move through the first two steps). If we had users abandoning the process, that number would be lower. Unfortunately it is normal, although not ideal, to expect some sort of abandonment in the process. It is those points at which a potential customer decides to leave that we must look at closer and address. It could be that a mis-spelling on the page in question is causing customer confidence to drop and thus leading them to abandon. It could also mean any number of other things like, technical errors in the checkout process, usability confusion, information overload, or you name it. The key is to determine what it is that is causing your potential customers to leave, and correct it. Turn a negative into a positive and your sales should increase. 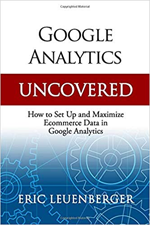 For a more detailed explanation and step-by-step setup process, as well as a nice “copy and paste” funnel path URL structure ready for Zen Cart, be sure to download a copy of Google Analytics Uncovered for Zen Cart: The Workbook.. This 70 page workbook goes into great detail on a number of items surrounding Google Analytics and Zen Cart. It includes tons of screenshots, step-by-step instructions, and many Helpful Hints directly relating to Zen Cart that are aimed at helping you increase sales from your store. In the final Part 6 of this series I’ll wrap up what we have talked about for the past few weeks and explain how all the pieces of the Google Analytics puzzle fit into Zen Cart. Until then … keep tracking. Is it possible to set up a funnel with a determined starting point and ending point, but where the pages in between don’t matter? In other words, a user comes in on Page A, then they could either go to Page B, C, or D, and then from there go to Page E. All I want to know is how many users who came in via Page A ended up at Page E. I dont care what happened in between. Is that possible? In reality, a funnel should be a series of pages. A “pathway to the end goal”. Not just a start and end point with nothing in the middle mattering. Providing that path gives users direction. The direction you provide builds customer assurance which in turn builds confidence. Both lead to more sales. Allowing customers to “aimlessly wander” through your site will result in less than desirable results and lost sales. If you want them to buy, you need to take their hand and “show them the way”. Having said that, if you really want to setup a funnel without any pages in between mattering, then it is possible (but not advisable) and, you have to be able to read and interpret the data figures to make sense of it all. Now set the “goal page” to the url you want to track where they end up at. Activate the Goal, and wait for your data to come in. When data comes in, you can look at the funnel path report and then take a look at the number of visitors who came to the first page. They will look like the “abandon the process” at that point (probably 100% abandonment) because they have nowhere to go in the funnel other than “out”. But, take that numeric figure of visitors to that page, and then compare it to the numeric figures that enter (or arrive at) the goal page. The difference in numbers will tell you how many people actually did start at page “A” and then never made it to page “E”. The result of those that ended at page “E” is the actual number reported. I may be wrong here, we’re just moving to Google Analytics from using StuffedTracker(.com) for our tracking. But it appears that “Goal Values” only allow one price point, and they don’t take into consideration orders with multiple items…so how can they report “total order value” and “total revenue” when it’s a static number? Is this information embedded in your Simple Google Analytics mod? And if so, since the goal value is added to your ROI stats…wouldn’t this duplicate sales and skew the stats? (which then I assume you would leave the goal value blank). I will likely buy your Google Analytics book…but this question has been bothering me since I’m used to having dynamic product prices in my previous stats package…at the very least, the number of products sold. FYI, we’re moving to Google Analytics for it’s “easy” ability to track Adwords campaigns. We can do this with StuffedTracker (price-per-keyword and everything) but it’s a lot of work to setup. I prefer the data security of a private tracker…but it’s not worth the effort anymore, we do multi-thousand keyword campaigns…and Google already knows ALL about those…so really, what’s the point in hiding our conversion stats from them? haha! But it appears that “Goal Values” only allow one price point, and they don’t take into consideration orders with multiple items…so how can they report “total order value” and “total revenue” when it’s a static number? Is this information embedded in your Simple Google Analytics mod? My mod handles the rest. We’re a fairly IT led company when it comes to reporting, and experiencing difficulty with management buy-in of GA goal data (we’ve been running GA for 2 years now). When someone completes a goal, e.g. website registration, what % tolerance would you say is acceptable comparing to our CRM database? How accurate should GA be? Is GA any more/less accurate than other tools? I’d be really interested to learn about other people’s experiences here! Can anyone help. I have set up goal funnels using virtual page URLs for the facebook application we have built. Although it appears to be calculating the conversion rates the funnels remain completely blank or in some cases part filled in. Would anyone be able to offer any suggestions on why this might have occurred. If your funnels are blank I would first check what you have set as the “funnel pages”. Also, did you set the first page in the funnel as “required”? If your conversions are tracking accurately but the funnel is empty it more than likely has to do with the variables and specifics you setup for each page in the funnel. Let me know answers to the questions mentioned here and we’ll see where we get. Also, not sure if this post will help you (not exactly what you are looking for but might give you another avenue for tracking) but here is one we wrote recently on tracking Social Media with Google Analytics.